Making India digitalized was the first aim of the Indian Government. Thus the Indian government launched free Wi-Fi in several public places so that the common people could be easily connected to the internet using a high-speed connection. The Indian Government have already provided free Wi-Fi in certain public places of India. The morale of the Indian Government would be boosted by the announcement of the CEO of Google Inc. The CEO of Google INC. recently announced that they will be providing free Wi-Fi connection in more than 100 railways stations across India. Google Inc. will be providing this service in collaboration with RailTel, which is the Rail Telecommunication of India. 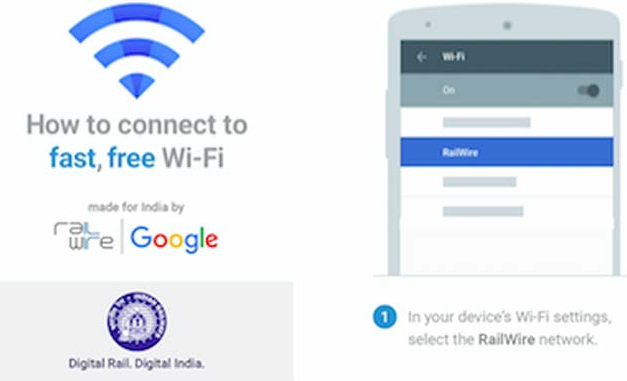 The CEO of Google announced that they will be providing free Wi-Fi in all the major railways stations across India. He also announced that this Wi-Fi connection will cover over 1.5 million people at the same time. Mumbai Central has been named as the first railway station for this project. This service would be provided to 100 stations across India. The project is expected to be accomplished on the end of 2016. If this project is accomplished properly, people would be able to check their important emails and chat with friends using the high-speed internet. This project of providing free Wi-Fi in railways is very fresh and seems very innovative. According to Google CEO, approximately 1.5 million users would be able to use this free Wi-Fi at the same time and connecting so much people at the same time isn’t an easy thing. But Google Inc. is doing this project in collaboration with RailTel which is the Railway Telecommunication Company. RailTel has access of more than 45, 000 Km across India. RailTel provides the connection between leading lines and stations. Thus the project is seeming very good as Google Inc. will be jointly working with RailTel for providing access to a lot of people at the same time. An individual will have to be in a major railway station where the free Wi-Fi provided by Google is available so that they may connect to the network. An individual will have to open their Wi-Fi settings for searching for available networks and after the search is completed an individual will have to select the option named RailWire network. Then an individual will need to open their internet browser and go to the official website of RailWire and then they would be obliged to enter their phone number on the website. After entering their phone number, an individual will immediately receive a SMS in their number which will contain a unique OTP and the individual will need to save the OTP number for logging the official website of RailWire. After that an individual will have to login to the official website of RailWire using the OTP number as password. After that an individual will be successfully connected to network and they would be able to internet easily at a high speed. A lot of people have raised questions about the procedure and whether it is free or not and if it’s free what would be the benefit of Google. Also, there have been questions about the maximum limit of free use in case the connection is chargeable. While mentioning about the terms and conditions, the CEO of Google Inc. mentioned that there would be no maximum limit of free use of the project currently. The common people would be able to use Free Wi-Fi currently as much as they want. Mainly the project is in the trial period and thus the amount of charges or maximum limit has not been acknowledged yet. Google Inc. first launched this project on Mumbai Central. Google Inc. has launched this project in 10 stations across India till now and the project is projected to cover 90 more railway stations. Currently the free Wi-Fi service is available in 10 stations named Mumbai Central, Bhubaneswar, Kachiguda, Vijayawada, Raipur, Bhopal, Jaipur, Patna, Vishakhapatnam and Ranchi. Launched By CEO of Google Inc. The Railwire Broadband Plan is all set for implementation. The new plan will not only offer internet connectivity, but will also offer more information about education and healthcare to the common people. If you are interested in knowing about this new broadband plan, then click on the link https://www.railwire.co.in/tarrifs-and-plans.php. On this page, you will get details about the various tariff packages, and internet speed.